It’s the yearly round up of what murals have been destroyed. We seem to average out at three a year but with development in London picking up a pace, we have a feeling that that average will increase. Back in April, the Hokusai Wave Mural in Camberwell got badly damaged in an explosion. We thought it might be a goner but if you read this blog, you’ll know it’s going to be be repaired – so good news there. Hopefully a repaint of the damaged area and a tidy of the rest of the piece will add many more years onto its lifespan. Hokusai Wave Mural, Camberwell, after the fire. Much of the lower left of the mural has been destroyed. Staying South and heading over to Battersea, we thought the Battersea Puzzle Mural would go this year. The mural is on a church building which is listed and they were waiting for the Diocese of Southwark to make a decision as to whether the building could be pulled down. We are not sure what the outcome of that was, but last month when I went through the area the mural was still there. Sticking in Battersea, the Doddington and Rollo Childrens Centre mural (which is painted on boards) was taken down as the Centre didn’t want it anymore. The good news is it got stashed in muralist Brian Barnes’ big cupboard of murals (well that’s my name for it!) so hopefully one day it’ll find a new home. And finally, we got news that a large part of the Everton Buildings mural in Euston was destroyed in building work. We are unsure of the extent of the damage but it a sad loss as it’s a great example of a good mosaic mural. There may be others that have been damaged or destroyed in the last year. If you know of any, please get in touch! 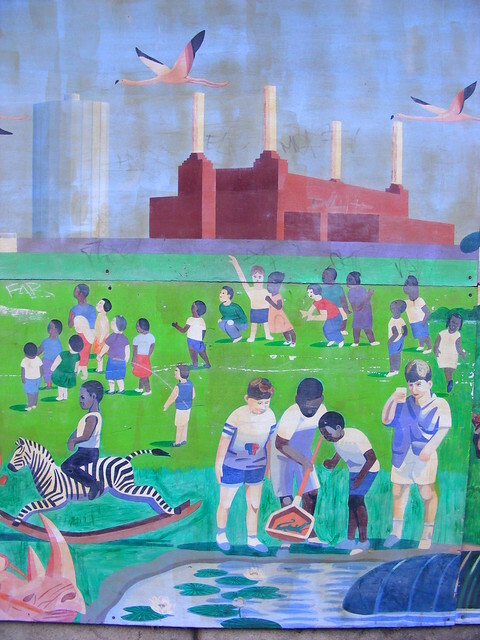 This entry was posted in London Mural Preservation Society and tagged Battersea, Battersea Puzzle Mural, Camberwell, Damaged Mural, Destroyed Mural, Doddington and Rollo Children Centre Mural, Euston, Everton Buildings Mural, Hokusai Wave Mural, London, Mural. Bookmark the permalink. These murals are rubbish, not everyone’s cup of tea, and nothing more than glorified vandalism. What right do you have to impose this so called “art” on everybody?